Catching up on this weeks news - God Bless Citizens United! I'm pretty sure I've seen this movie before, but this version seems to have a better script and is less hairy. This is my dinner. 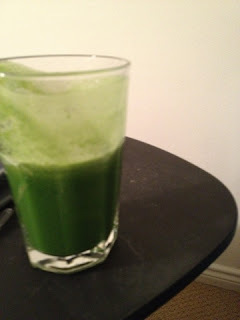 It is a pretty noxious combination of watercress, cucumber, celery and I think I threw in some lemon. The ginger and cayenne make this barely palatable.